Molly has always longed for a mother like that of best friend Ellen. Ellen who eats packaged foods and lives in a world of pop songs. Molly's mother talks to nature, concocting potions to cure almost anything and tends to her menagerie of animals, that both Molly and her mother call family. She wishes her father wasn't missing somewhere in Cuba or that her twin brothers would need to travel to find adventure, and she certainly wishes the elderly Mister and Mrs Grimshaw next door would mind their own business and stop picking on The Gentleman, their rooster who crows at all hours of the morning. To stop the nosy neighbours, Molly's mother devises a plan to grow a tree to block their view over the fence. A tall and majestic tree that she claims will be fully grown in a week, and sets off to collect the ingredients needed for her concoction. Pim has always been a strange boy, alone and marching to the beat of his own drum. Molly is drawn to his sense of wonder and whimsy, but with best friend Ellen beside her, would never dare approach him. Ellen, with her perfect home, perfect mother and perfect life. 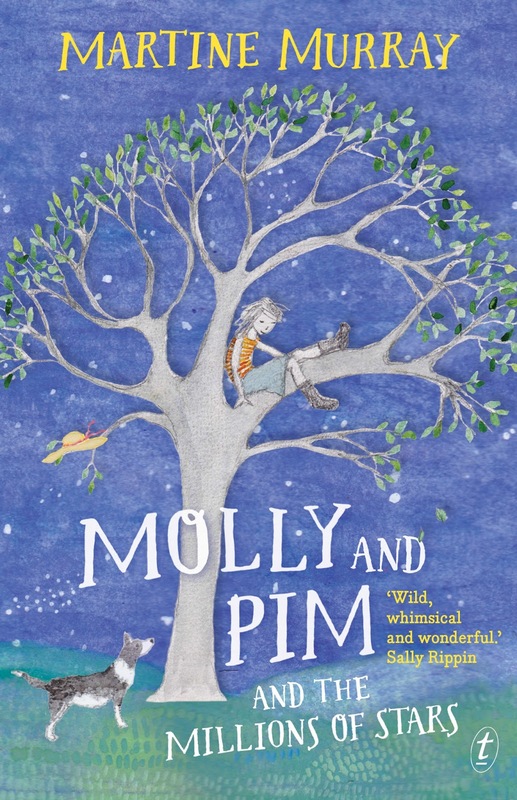 But when Molly's mother's spell goes horribly wrong, it's Pim she turns to for help. Molly and Pim and the Millions of Stars was a joyful and lovely middle grade read. Contemporary sprinkled with magic realism, the underlying story is about friendship, acceptance and learning the value that the grass isn't always greener. Molly is at that age where she's incredibly self conscious about how she's perceived. She see's best friend Ellen as having the perfect life, full of modern conveniences and so far removed from her own. She's inquisitive, but wants nothing more for her mother to be normal. Until she suddenly doesn't have a mother. Sort of. A spell that has gone horribly wrong leaves Molly to fend for herself and no one to turn to. She can't tell Ellen what's happened to her mother so that leaves weird and wonderful Pim. I loved his character. He brought spark and personality to the storyline and was a brilliant example of all things unique. He was understanding, not to mention reliable and gave off an air of honesty. The most magical aspect of the storyline was the fantasy elements. It added such a lovely sense of whimsy. The only negative aspect for me was Molly's missing father and brothers. Her father was supposedly lost in Cuba, but the storyline didn't expand further on his character or lack thereof. For children, Molly's missing father may pose more questions than answers. A small gripe that also could also be used for further discussion with older children. 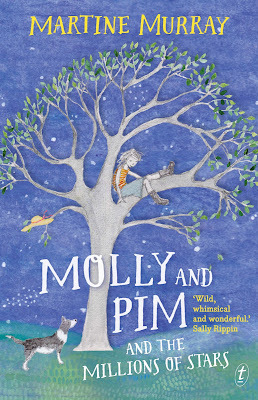 Whimsical and utterly lovely, Molly and Pim and the Millions of Stars will enchant middle grade readers and adults alike. Children will adore the magical realism and the underlying storyline of friendship and acceptance. The monochrome illustrations throughout are simply lovely. A delight to read. This looks LOVELY. I do love a good middle grade and the magical realism elements seem really lovely. Plus, it's got illustrations?? Heck yes. It does, just a few little ones scattered throughout. It's really lovely though, so incredibly magical. Looking forward to seeing what you think of it poppet. This sounds like a really beautiful, magical read Kelly! Although it was a bit thin on the missing father, sounds like the rest of it was pretty fantastic. It was a little strange that he was missing, along with her brothers. Probably would have made more sense to make her mum a single parent and only child instead. But it was adorably cute, really enjoyed it. IT WAS SO CUTE!! I'm reviewing it tonight and jfdskal I really loved all the cute food and the Australian-ness and the name Pim. I'm weird about names. I just like them. I wish Pim had had more of a backstory though?? I mean WHO EVEN WAS PIM?!! also much chocolate and cashew balls. Much goodness. I assumed Pim might have been a girl at first, and I would have loved to have learnt more of his backstory too. Much, much goodness. You had me at "whimsical". ;) The storyline sounds like something I actually LOOK for in Middle Grade (personally, I prefer Middle Grade novels to have a whimsical feeling about it.) Lovely review!! Me too Kara, that little touch of fantasy makes all the difference doesn't it. Sweet and incredibly whimsical, it's absolutely lovely. Sounds like an odd little book, but in a good way. I'm glad you liked it overall. I like the magical realism aspect - I don't know if I've read anything like that before. Or not in awhile at least. It really was Lauren, but so incredibly lovely nonetheless. That's one of the aspects I really enjoy with middle grade, it has an innocent type of whimsy that you just can't find in any other genre. I love middle grade reads Joy, they keep you young with that sense of imagination and wonder. I was actually looking at the Lemony Snicket series this morning to purchase, perfect timing. I love middle grade, it's always an absolutely pleasure to read and this one is just so incredibly lovely Nirvana, and by an Aussie author as well, which is always a bonus. Me too Wattle and it really is. I love middle grade, especially from Aussie authors. It makes such a lovely change from all the dystopians I tend to read. I really loved it, absolutely adorable! Thanks Naban. I loved how utterly magical it was, was exactly what I needed, a lovely quick read that was incredibly entertaining and sweet.